University of Tennessee OT Antonio Richardson, an early entry into the 2014 NFL Draft, has signed with Eugene Parker and Tory Dandy of Relativity Sports. A CBSSports.com Third-Team All American, Richardson is considered one of the top offensive linemen in the 2014 NFL Draft. Additionally, he earned SEC Coaches Second Team All-SEC honors in 2013. 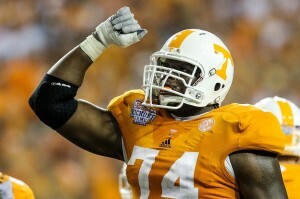 Richardson finished his Tennessee career starting the final 24 games at left tackle. The Volunteers rushed for over 2,261 yards this past season, good for the school’s most rushing yards since 2004. Sports Agent Blog has Richardson as the No. 5 rated offensive tackle in next May’s Draft. NFLDraftScout.com lists the Nashville, Tenn. native as the No. 6 rated OT and projects him being taken in the 2nd round. Coming out of high school, Rivals.com ranked Richardson as the state of Tennessee’s top overall prospect; he was named the seventh best tackle in the nation.